The Pale-headed Rosella is a member of the white-cheeked group although the northern, nominate race has a mainly blue cheek patch and some northern racial variations have total blue cheek patches. This rosella is the only member of the genus to carry blue body colour, some having the entire frontal and underneath body areas a deep blue. Hence the earlier common name of Blue Rosella. Length is 32cm females usually shorter. They can be found in north eastern Australia including all of Cape York Peninsular and south approximately to the latitude of 31o in NSW. The western limits stretch from the region of Coolabah, NSW in the south and northward to Mt Vernon and Ballon districts of Queensland then to Gowan and Grey Range areas near Emmet, Mutaburra, Tangerin and to the south eastern corner of the Gulf of Carpentaria near Kuramba. 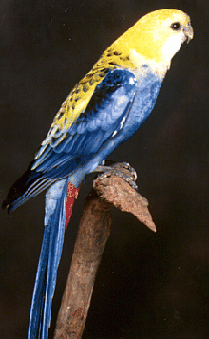 There are many subspecies of the Pale-headed Rosella. Consists of seed, nuts, fruit, berries of native and introduced grasses, weeds, shrubs, trees as well as blossoms, vegetable matter, pollen, nectar, grit and charcoal. Usually from August to October they usually lay 3 to 6 eggs, which are white, rounded, oval eggs. Incubation is 19 days. The young chicks fledge approximately at five weeks. It takes up to 2 years to colour fully. The preferred nest is a hollow log. The sexes are alike but the male is usually brighter in colour and slightly larger, particularly noticeable in the beak and the head which is broader with a large brow and flatter crown while the female has a small beak and a head with a low brow and domed crown. Similar differences are usually present in the juveniles.